Turns out that the Illinois police officer who claimed that he was in pursuit of three suspects before he was found shot and killed staged the scene to look like murder, and police officials are now stating that it was a "carefully staged suicide," according to NBC News Chicago. When the Sept. 1 shooting was initially reported, Fox Lake, Ill., Police Lt. Charles Joseph Gliniewicz was hailed as a hero who died in the line of fire trying to keep an area safe. The new account of Gliniewicz's death tells a different tale, of a 52-year-old veteran of the police force who stole money from the youth program he oversaw. Police now believe that the lieutenant became increasingly nervous after learning of a recent audit of department funds that he thought might lead police to his doorstep. Speaking at a news conference Wednesday, Lake County Major Crimes Task Force Commander George Filenko told those gathered that Gliniewicz was under investigation for embezzling thousands of dollars from the Police Explorer Post, a program that works with young people who are interested in becoming police officers, NBC News reports. Gliniewicz reportedly spent the money he took from the program on various items, including adult websites, gym memberships, mortgage payments and travel expenses, according to the report. "We have determined this staged suicide was the end result of extensive criminal acts that Gliniewicz had been committing and … he was under increasing levels of personal stress from scrutiny of his management of the Fox Lake Police Explorer program," Filenko said. "Gliniewicz committed the ultimate betrayal." According to the Associated Press, on Sept. 1 Gliniewicz called for backup because he claimed he was chasing three men—two white and one black—near a swampy area north of Chicago. 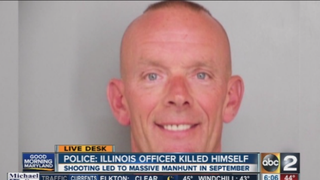 By the time other officers arrived, they found Gliniewicz's body near his police car. The officer's death sparked a manhunt in which "around 50 suburban Chicago police departments and sheriff's offices assisted, racking up more than $300,000 in overtime and other costs," AP reports. A preliminary investigation of the facts led authorities to believe that Gliniewicz had been shot with his own weapon, which was recovered at the scene. Police detained three men seen on security cameras near the lake where Gliniewicz's body was found. The men were questioned and released, AP reports. Police now believe that Gliniewicz staged an elaborate scene to lead police to believe that he had died in a struggle with his attackers, including shooting himself twice in the torso. Police officials note that text messages and Gliniewicz's financial records revealed his "ongoing criminal activity," ABC News reports. Gliniewicz, a father of four, was nearing retirement, according to NBC News.